A second evening event will showcase a series of talks and panel discussion with Mayatili Marika, Ramon Martinez-Mendoza, Megan Evans, Linda Choi, Raafat Ishak and Benjamin Sheppard. This will be videoed for later internet publication, and the entire project will be documented in a printed publication with essays in the months following the active exhibition event. The Bureau for the Organisation of Origins (BOO)explores the national preoccupation with identity by examining Australia’s cultural self-evaluation leading up to, and ‘celebrated’ on, Australia Day. The ‘BOO’ is a collaborative and interdisciplinary visual arts project that converts the BLINDSIDE Artist run space into a working ‘bureau’ to comment on Australian identity on and around Australia day 2017. 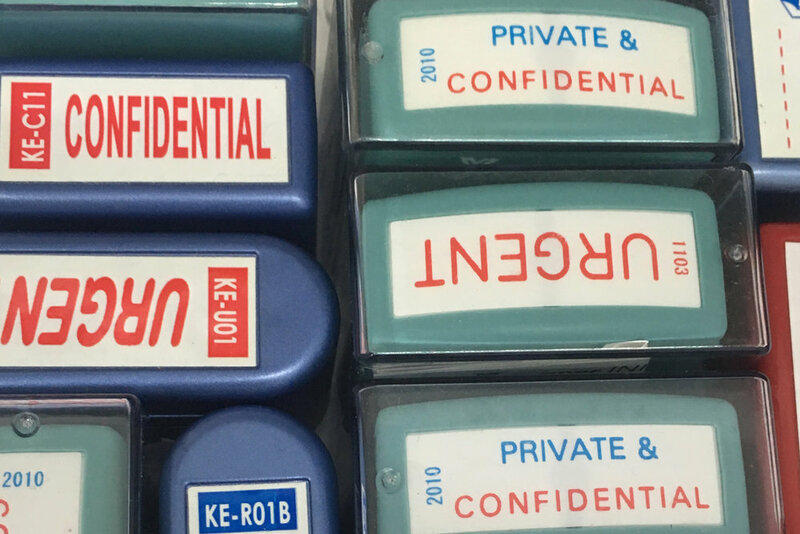 As a bureau, the project embodies the idea that the nation state essentially operates an administrative bureaucracy. The format supports the themes while providing a space to discuss and debate various issues regarding Australian identity as revealed through a range of artistic gestures and discursive events. The exhibition incorporates panel discussions, workshops and publications along with a range of carefully curated interdisciplinary art works. The ‘bureau’ context prompts dialogue around issues of heritage, place and belonging and the organisational systems that end up affecting everyday experience. The exhibition will be regularly activated by BOO artists and invited contributors during opening hours across the exhibition period. Benjamin Sheppard will be basing his drawing research in the Bureau for the entire exhibition period. Peter Burke + Adele Varcoe will be intermittently engaging with the gallery and surrounds and guest Artists will be invited to engage with the Bureau across the exhibition period. Elmedin Žunić will stage a performance of his Archaic Typewriter work at the opening on the 26thof January. Watch the BOO Facebook page for updates on other organised performances. The Bureau for the Organisation of Origins (BOO) explores the national preoccupation with identity by examining Australia’s cultural self-evaluation leading up to, and ‘celebrated’ on, Australia Day. a working ‘bureau’ to comment on Australian identity on and around Australia day 2017. As a bureau, the project embodies the idea that the nation state essentially operates an administrative bureaucracy. The format supports the themes while providing a space to discuss and debate various issues regarding Australian identity as revealed through a range of artistic gestures and discursive events. The exhibition incorporates panel discussions, workshops and publications along with a range of carefully curated interdisciplinary art works. The ‘bureau’ context prompts dialogue around issues of heritage, place and belonging and the organisational systems that end up affecting everyday experience. and collaborative gestures will be staged in and around BLINDSIDE ARI and its immediate precinct. 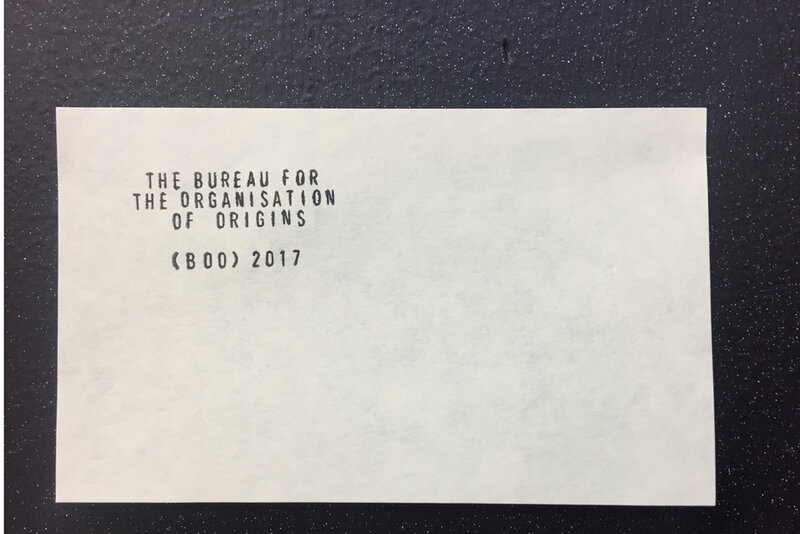 As an experimental inquiry into notions of national identity, the project will operate as 'The Bureau for the Organisation of Origins (BOO)' and will simultaneously serve as workshop, meeting venue and exhibition space. The BOO will speculate on the specific preoccupation with national identity by examining Australia’s cultural self-evaluation surrounding, and ‘celebrated’ on, Australia Day 2017. An aspect of this speculation will be reflexive and evolve over the course of the exhibition with artists and participants ‘working’ at the BOO. Comprising a ‘back room’ office and ‘waiting room’ foyer, the gallery spaces will be activated as a base of operations for performances, workshops and an evening forum event. Various associations between objects and actions will work to unpack the attitudes and actions that flood popular media platforms on and around Australia Day. The project aims to interrogate the problematic nature of ‘representing’ Australian national identity through various artistic and performative gestures emanating from, and embodied within, the administrative model of the ‘bureau’. The work will directly engage the public, including a number of contemporary art practitioners and invited guest collaborators, in a discourse regarding the instigation and perpetuation of Australian national identity; various performative works will extend beyond the gallery into nearby public spaces, engaging ‘Australian Open’ tennis fans, tourists and the general public. Historically important indigenous art by Wandjuk Marika OBE will hang next to contentious contemporary works by Carly Fischer, Sean Lowry, Megan Evans and others. Brochures, flyers and badges will be produced by the Performprint collective and seemingly pointless bureaucratic performances by Peter Burke, Adele Varcoe and others will randomly ‘happen’ provoking thought on what it really means to be Australian at a time that ‘celebrates’ a day of dispossession. Rushdi Anwar is a Melbourne-based artist originally from Kurdistan. His works often reflect on the socio-political issues of the Middle East. As a new Australian, his works reference the social and political unrest in his home country and his Kurdish heritage, heightening a global set of thinking. In the middle-east on another project at the time of the BOO, he is currently producing a video work that critiques, what he calls, the “dark slogans” of political narrative in the middle-east; using the words ‘Hope’ and ‘Peace’- the terms we all relate to. Peter Burke is an artist living and working in Melbourne, Australia who uses marketing strategies combined with current concerns and conventions of art, especially those involving social interaction in public spaces. By these means he examines and questions the general condition of contemporary consumer society. Linda Choi is a planning and environment lawyer with a Master of Laws from Monash University. She has a particular interest in urban water policy through her involvement as a senior researcher for the Corporative Research Centre for Water Sensitive Cities’ Program B5.1. She has presented her work at a number of conferences including the 2016 International Low Impact Development Conference in China. Prior to law she had a career as a senior project architect, and holds degrees in Architecture from the University of Melbourne and Fine Arts from the Royal Melbourne Institute of Technology. Jaye Early is Melbourne-based artist from the Boorooberongal band of Darug country, NSW. He works in painting and video-based performance; utilising these mediums to investigate complex and sometimes uncomfortable personal experiences in public spaces. An intention of Early’s work is to consciously transform his personal dislocations into a visual strategy of disclosure often by utilising his own body as site and surface for art-marking. He has exhibited both nationally and internationally since 2009. In 2016 Early was a finalist in the Bayside Acquisitive Art Prize, the Redlands Biennial Art Awards, the Hornsby Art Awards, and the Kooire Art Prize. In 2014, Early was a finalist in the Victorian Indigenous Art Award and in 2013 he was a finalist in the Black Sawn Prize for Portraiture and semi-finalist in the Doug Moran National Portrait Prize. Megan Evans is a multidisciplinary artist, working in video, photography, sculpture, and installation. Megan’s work is informed by social issues, examining the nature of belonging and the impact of colonisation on identity, both self and nation. Megan began her creative life doing large political murals in the 1980’s during which time she met and later married Indigenous artist and activist the late Les Griggs which informed her perspective on colonisation. International solo exhibitions include MEET YOUR CRIMINAL ANCESTORS at The Royal Standard Liverpool UK 2013; SIMPLICITY at BOXOprojects, Joshua Tree California USA 2013; TO Bee at BoxoFFICE Gallery, New York NY, 2011. Australian Solo Exhibitions include UNreconciled in TREATMENT at Melbourne Water. 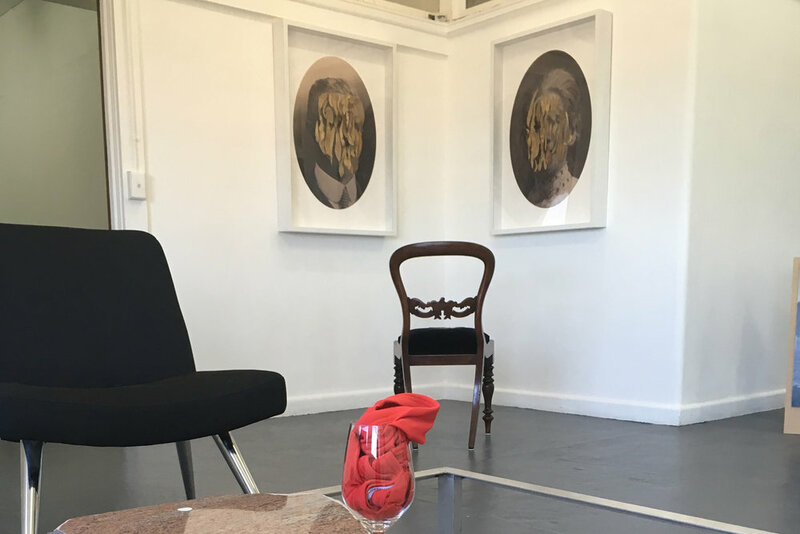 Werribee 2015, UNsettled –Trocadero Art Space, Melbourne 2016, KELOID in Knots, Linkages and Grafting – Roslyn Smorgon Gallery,FCAC, 2014; Requiem – G3 Artspace, Parkdale, Victoria. Carly Fischer is a sculptural installation artist from Melbourne, Australia. She recently completed an MFA at Monash University, studying under Professor Callum Morton, having previously graduated from RMIT University in 2000 with a BFA (Hons). Since 2000, she has exhibited widely in Australia, Germany, Austria, Belgium, the Netherlands, the US, the UK and Japan, through solo, group and collaborative projects. 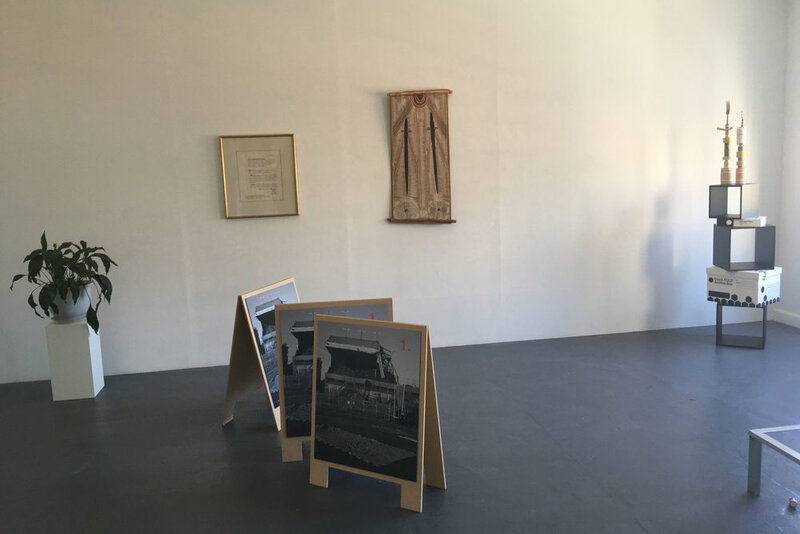 Recent exhibitions include at BLINDSIDE, Bus Projects, Watch This Space, Craft Victoria, Linden Centre for Contemporary Art and Helen Gory Galerie, Australia, KWADRAT and REH Kunst, Germany and MU Artspace, the Netherlands. Raafat Ishak and Tom Nicholson’s collaboration ‘Proposition for banner march and a black cube hot air balloon’ is presented in the Bureau for the Organisation of Origins. This collaboration is centered around an ongoing series of forms and events conceived as propositions towards a future public action involving a banner march and a black cube shaped hot air balloon. The balloon tries to follow the march. The march tries to follow the balloon. The nature and possible meanings of this future event have been articulated in a range of forms, including text, found images, paintings, public actions, and sculptural objects, many of which were presented in the exhibition and Shepparton Art Gallery in 2012, planned as part of the lead up to the eventual realisation of the event in Shepparton. Mayatili Marika is a member of the renown Yolngu family and is the daughter of Wandjuk Marika. As a lawyer, Mayatili has worked at the highest level in difficult negotiations over Northern Territorian land rights and other related issues. She has recently coordinated Garma Festivals in Gulkula near Nhulunbuy in Arnhem Land and has recently been appointed as a Dark MOFO producer. Wandjuk Marika OBE (c. 1930–1987), was an Australian Aboriginal painter, actor, composer and land rights activist. He was a member of the Riratjingu clan of the Yolngu people of north-east Arnhem Land, Northern Australia. His paintings expressed his people’s traditional religious beliefs, and included Djang’kawu Story (1960) and Birth of the Djang’kawu Children of Yelangbara (1982). Djang’kawu is the founding ancestor of the Riratjingu in traditional stories. He co-founded the Aboriginal Arts Board in 1973, and became Chairman in 1976. He was appointed an Officer of the Order of the British Empire that same year. His name was given to the Wandjuk Marika 3D Memorial Award, a category of the prestigious National Aboriginal & Torres Strait Islander Art Award, awarded annually by the Museum and Art Gallery of the Northern Territory. His portrait hangs in the National Portrait Gallery in Canberra, and several of his paintings feature in the Art Gallery of New South Wales. As an actor, Marika appeared in the films Where the Green Ants Dream (1984) and Initiation (1987). He also appeared in the television miniseries Women of the Sun. He was both actor and composer in Where the Green Ants Dream. He was the author of The Aboriginal Children’s History of Australia. Marika wrote frequent but unsuccessful letters to the Australian federal government to protest against mining activities on Yolngu lands. Benjamin Sheppard is a current PhD candidate at RMIT in Melbourne and holds a Bachelor of Fine Art with Honours from the Victorian College of the Arts. With a practice based in contemporary drawing, he is the founding member of Ways and Means– an experimental collaborative drawing project. His PhD project examines the relationship between the process of drawing and the creation and perpetuation of the Nation State. Ben teaches in drawing and contemporary art practice at RMIT’s Bachelor of Fine Art and Melbourne Polytechnic’s Bachelor of Illustration. In the BOO, he operates as instigator, curator, collaborator and participating artist. Adele Varcoe is an Australian artist and designer who creates fashion experiences that explore the social effects of fashion, dress and clothes. She brings people together to construct participatory performances that explore the elusive nature of fashion by putting people in a situation where their sense of self is heightened through their clothes. Working with actors, models and the public Adele investigates how fashion affects the interactions and relations between people. She is interested in the behavior fashion evokes and the role social interaction plays in shaping our perception of dress. Currently, Adele is digging deep into her practice by undertaking a PhD in the School of Fashion and Textiles at RMIT University. She also teaches and runs workshops with various Universities and organizations around the world. Nick Waddell is a multi-disciplinary Visual Artist who has exhibited widely and regularly since 2003. In 2015, he completed a Research Master’s degree from the Victorian College of the Arts, where he continues as a PhD candidate in the visual arts program. His practice spans various modes of making including: Sculpture, Photography, Drawing and Painting. During this time, Nick has been closely involved with Melbourne based Artist Run Initiatives, notably, contributing to the Westspace Gallery selection committee from 2009-2014. (Chairing it from 2012-2014). Nick is a keen and regular contributor to various Artist talks, teaching seminars and instructional workshops. Elmedin Žunić was born in Bosnia (former Yugoslavia) in 1979 and has lived in Norway since the war in the 1990’s. Having since come to Australia, he achieved a Bachelor and Masters of fine art from RMIT and is currently completing a PhD at the Victorian College of Art. He works across a wide range of media, encompassing installation, photography, drawing and video. Over the past 10 years he has been actively involved in both the art scene of Australia as well as those abroad; exhibiting in South Africa, Kurdistan and Norway. Philosophy forms a strong aspect of Elmedin’s conceptual framework. His work often refers to philosophies that address alienation, identity and existentialism.